The PacSafe Intasafe Mini Crossbody Bag is a compact bag but with plenty of organisational pocket space including a Velcro RFID Blocking Pocket inside. This simple bag has mesh zipped internal pockets that keep your valuables safe. It features a detachable strap that anchors to a fixed object and main zippers lock to hardware to provide extra security during your daily commute. The bag is made of durable and splash resistant ballistic ripstop polyester. It has a attached internal key clip for your keys and separate pockets for your cards and other stationery. The Intasafe mini-Crossbody bag is well-designed for regular travelers to carry gadgets and accessories. Crossbody Strap Length: 34" - 64"
The Pacsafe Intasafe Mini Crossbody - Black has many exciting features for users of all types. 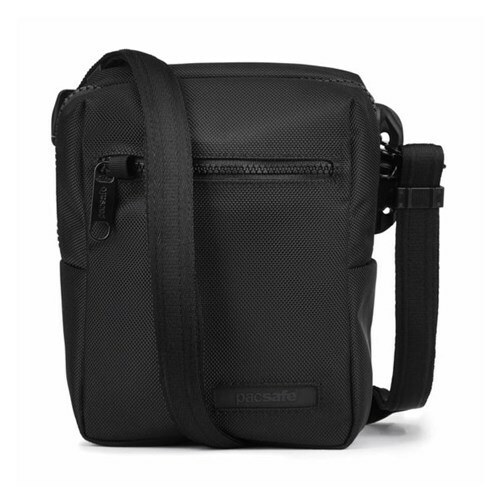 See the Pacsafe Intasafe Mini Crossbody - Black gallery images above for more product views. 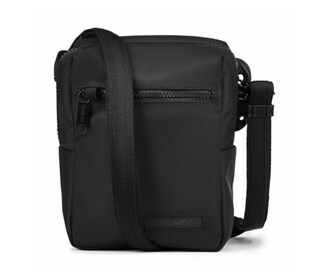 The Pacsafe Intasafe Mini Crossbody - Black is sold as a Brand New Unopened Item.